Cosmos are freely flowering annual plants that are ridiculously easy to grow. If you're looking for a flower that will stay in bloom for months and can be grown by simply scattering seeds, cosmos are a great choice. The flowers sit atop long slender stems and form a cloud of color that not only looks attractive throughout the summer but also attract bees, butterflies, and birds to your garden. Cosmos grow as easily in beds as they do in containers and they also make great cut flowers. The plants can handle drought, poor soil conditions, and general neglect. They even self-sow, but not to the point of becoming a nuisance. This is a truly low maintenance plant. Botanical Name: Cosmos sulphureus and Cosmos bipinnatus are the two most common types. 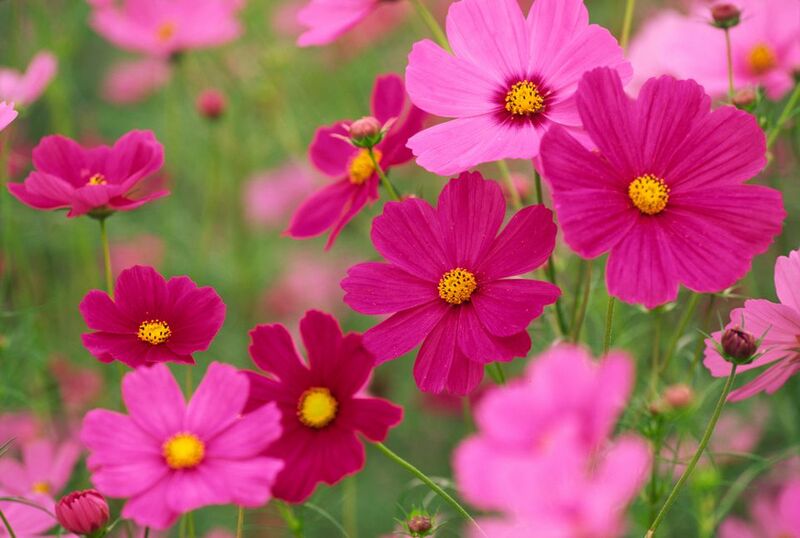 Plant Type: There are cosmos species that are perennials, but the common garden cosmos are grown as annuals. Soil pH: Neutral soil pH of 6.0 to 6.8. is best, but cosmos don't really care. Flower Color: Golden yellow, white, pink, magenta, orange, yellow, reds and chocolate. Cosmos are quintessential cottage garden flowers and mix well with just about everything. The taller varieties look good in the middle or rear of the border, with spiky flowers, like Agastache and Goat's Beard, and with rough-textured flowers such as coneflowers and black-eyed Susans. Shorter varieties make very colorful, airy edging plants. Cosmos also grow well in containers and make good cut flowers. Cosmos flowers are daisy-like with ray florets surrounding the center disc of florets in a shallow cup. There is a broad range of color and more every year. The leaves grow opposite and are either deeply lobed, pinnate, or bipinnate and feathery, depending on the variety. Since few pests bother cosmos, the plants look good all season. There are two types of cosmos typically grown in gardens. The Cosmos sulphureus is a North American native with golden yellow blooms. It is very drought tolerant and loves hot weather. The plant grows 1 to 2 feet tall and comes in double and semi-double flowers. Some of the more recent cultivars tend to be shorter, more orangy, and with smaller flowers. Cosmos bipinnatus are the colorful daisy-like flowers that come in white, pinks, reds, and orange. There are quite a few series of hybrids. Although they are not quite as heat tolerant as Cosmos sulphureus, they will grow well just about anywhere. For the best flowering, choose a site that gets full sun. Cosmos will grow in partial shade but will have fewer blooms and less vigorous plants in shadier areas. They will grow in poor soil, although adding some organic matter will give them the well-draining soil they prefer. Don't make the soil too rich. Otherwise, you'll get thin, scraggly stems and fewer blooms. You should not need to water your cosmos plants unless there is a prolonged drought. Even then, the water would be better used elsewhere as they are very hardy. Wait until all danger of frost has passed, before sowing or transplanting outdoors. They grow very quickly but can be killed by a late frost, so don't rush it. Humidity should not impact these plants. Unless your plants seem to be struggling, there is no need for fertilizer. Cosmos can handle poor soil and fertilizing can have a negative impact. Soil that is too nutrient rich can actually produce plants that are weak-stemmed, late blooming, and flower sparsely. You can start seed indoors, 4 to 6 weeks before your last frost, but cosmos are quick to start growing if you direct seed them outdoors and will catch up to those started earlier. Cosmos are also widely available as seedlings if you don't want to or forgot to plant the seed. Seed packets usually recommend something absurd, like 2-foot spacing, but you will get a better display if you simply scatter the seed and let the plants support each other, as they grow. You can always thin if you need to, and move the extra plants to another part of the garden. Plants may reseed and it is also very easy to collect the dried seed at the end of the season, to save for next year. If they are hybrids, you never know what you may get. Chocolate Cosmos (Cosmos atrosanguineus): The dark red flowers do indeed smell like chocolate. This is a perennial that is hardy to USDA Zone 7, but it is much more finicky than the annual cosmos. Very little maintenance is required. Tall cosmos varieties can flop over, so if you are not growing them closely or near other plants that can support them, you may need some type of staking. The only real maintenance cosmos plants need is deadheading which will prolong the flowering season. If you fall behind, simply shear the plants by about 1/3, when most of the flowers have faded. You'll get a second flush of leaves and flowers.